We concepted and built a prototype for a radio app. 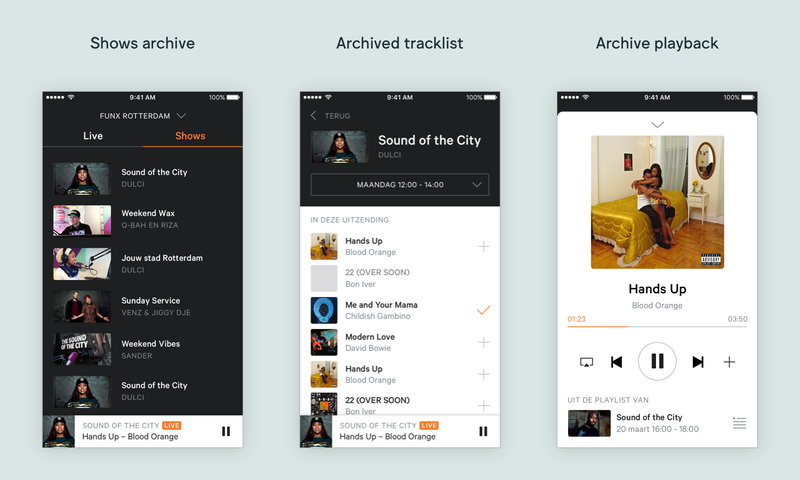 We concepted and built a prototype for a radio app, in which you can do anything from automated archive playlist creation to selecting and adding your favorite songs in-app anytime you hear something pretty. We love radio and the NPO, which is the only non-commercial broadcaster in the Netherlands with amazing content. For a long time, we wanted to experiment with the future of radio. Using the publicly available content of the NPO was the perfect combination of these needs & wishes. We added a couple of weeks of development into the project and realized this prototype, putting radio and the back catalogue of all music shows together in one optimized experience. 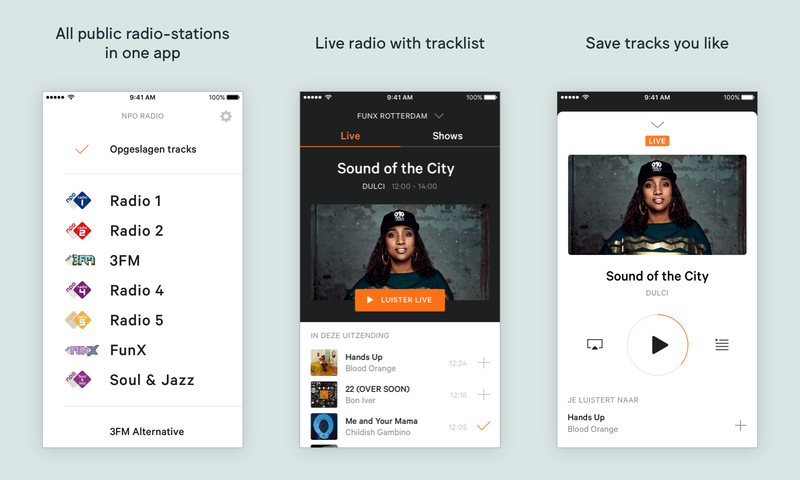 It is important to note this version of the radio app is aimed to offer the best (popular) music experience, and therefore does not include current events like news, sports or longtail content like podcasts. Regular radio is a monologue, which is no longer what users expect. We came up with an app that holds all NPOs channels as live stations. When you open the app, you are asked to log in to Spotify in order to play full-length songs, or you can skip to listen to 30 second previews. You are then presented with an overview of all channels and one additional channel on top called “saved tracks”. This is for every song you ‘like’ and store while listening. When you click on a channel, it starts playing the live broadcast, but you can also choose to go to ‘shows’. ‘Shows’ is a back catalogue of all the shows that have been playing. All these shows have automatically been generated into playlists. Regardless of whether you’re listening to the live broadcast or to an older show’s playlist, you can always add the current playing song to your “saved tracks” (with the +). This a very simple, but extremely useful function. For this app we used the Spotify SDK, which beautifully supports the full integrated use of their catalogue. The Spotify integration works two ways. We use the catalogue for playback within the app, but we also create your personal playlist within your Spotify account. This means that wherever you are, you can open Spotify and listen to the tracks you’ve saved. As a nice bonus, the playlist called “My radio - saved tracks” appears at the top of your Spotify, so every time you open Spotify you’re subtly reminded of the existence of Radio app. Especially for this app we built a Content Management System which gathers all metadata of all NPOs radio channels, which information is publicly available. Shazam-like functionality was added to supplement any missing metadata - such as song and artist name - necessary to find songs in the Spotify catalogue. With this metadata we search through Spotify and find the matching song, then create a feed which is fed to the app in order to display the auto-generated playlists of all shows. For every song that doesn’t provide the right metadata, we tested a Shazam-like audio fingerprinting technology to help. By using this technology, we can achieve a hit-rate of 95% on the popular channels. By knowing all the Spotify IDs, we can auto-generate playlists of the shows on air. This creates a back catalogue without any effort, which is easily accessible without the spoken pieces by the DJs in between the songs. One of the ideas that we haven’t implemented - only tested roughly - is the recommendation of songs, shows, and artists of the NPO content-wide. This is a logical next step, but falls outside of the scope of the prototype-experience we wanted to build. Next Empire has a great relationship with Sonos. Because of this, we have gotten official access to their private APIs. We can use this to push any stream from any source directly from our custom app to the Sonos system in people’s houses. This means that the listening experience is no longer exclusive to either the Sonos app or the Spotify app. In addition, we implemented easy streaming through Apple’s Airplay protocol and Android’s Chromecast. We concepted, designed and built a fully working iOS prototype of this app. Amongst others, this was completely worked out with a custom CMS, audio fingerprinting, wireless playback integration and a new design with two radio experiences: LIVE and past shows.